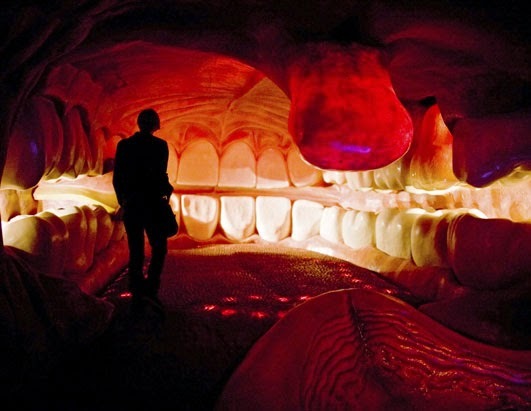 If you find the words "giant uvula" stimulating and you don't even know what it means, you belong at Corpus, near Amsterdam in the Netherlands. It's a 115-foot museum shaped like a sitting man. Again: THE BUILDING IS SHAPED LIKE A PERSON. I know. I'm running out to get a lifetime membership today. And as if that weren't enough, the entire inside of the building is the guy's anatomy. You enter through a wound in his leg and travel upwards, viewing things like cheese getting digested and synapses getting fired in the brain. Oh, and the man burps when you jump on his tongue. I know. Make that the gold club lifetime membership. my uvula leans towards the left. i learned that when i was a "patient" at my friend's hygienist school.